STOP PRESS. – Fantastic news! In light of recent concerns raised by members, we have made the decision to suspend future funding agreements with formula milk companies pending a College review of our relationships with them. The suspension covers receipt of funding from Danone and Nestle, two companies which have met our due diligence criteria which the College has in place to consider partnerships. We have had relationships with both for more than one year. 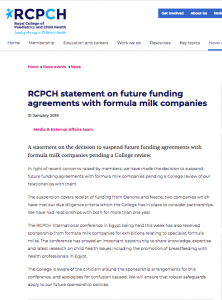 The RCPCH International conference in Egypt being held this week has also received sponsorship from formula milk companies for exhibitions relating to specialist formula milks. The conference has proved an important opportunity to share knowledge, expertise and latest research on child health issues including the promotion of breastfeeding with health professionals in Egypt. The College is aware of the criticism around the sponsorship arrangements for this conference, and apologises for confusion caused. We will ensure that robust safeguards apply to our future sponsorship policies.